For a few weeks now, I've been saying that I'll put something playable of Todo up, but I just never got it into a position where it felt remotely presentable, even with the caveat that this was not complete work. However, tonight I think I've got it to a pretty good place to call a first prototype - most of the interface works and you can complete a task, so you can see the rough mechanics of the game. Have a go at this! Your mission, should you choose to accept it, is to acquire a "PipeBit" (which you can't use yet) and collect all 71 available Quest Points. Use the arrow keys with X to jump, and Up to interact with things - Q brings up the menu. You'll find that the game has some holes of varying degrees of hilarity and you have a couple of abilities which you won't really have from the start of the game, but feel free to poke around and do the unexpected - you may be surprised at what I've thought of (or more likely what I haven't). It may seem slightly disappointing that I've been working on this for a few weeks to achieve roughly three minutes of gameplay, but so much of that time has gone into the backend - taking the base Crystal Towers 2 engine (which you'll see evidence of) and doing it... right. I've grown to love the Hatogate scripting engine as it grows more and more into what the game needs it to do - the game is pretty easy to expand now, and the game so far serves as a decent showcase of what it can do in terms of interacting with objects and characters. The scripts and rooms are all plain text in the "rooms" folder, so you can open them up and fiddle around with them if you like. Best of luck with that. I haven't been as pleased with my game creation in a long time! I'm already beginning to see this as "Crystal Towers 2 done right" - I'm still proud of that game (after all, this one is directly based on it), but it had a lot of awkwardness in the system which came from not having any experience writing a game of that size. 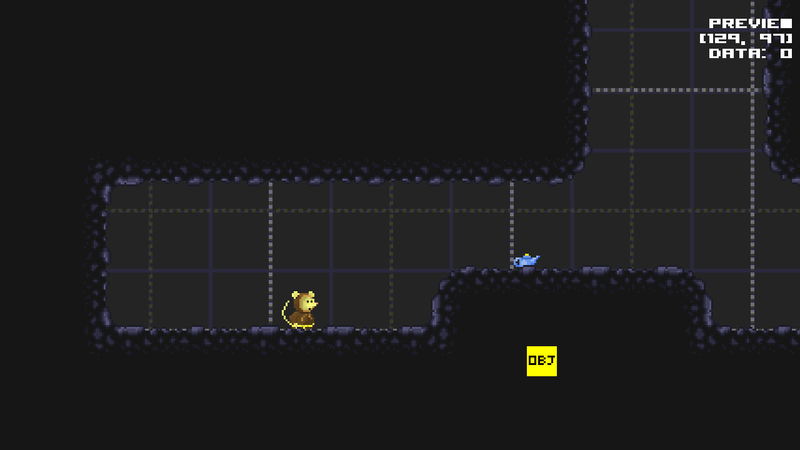 This time, I'm getting the opportunity to correct a lot of the mistakes - for example, the "boost"-style ability is now activated with a quick double-tap while in the air, rather than having to be selected and assigned to a spell key, and the general platforming experience is a lot more fluid as a result. Wrote procedures to save a compressed level format - instead of saving every value, it does what CDs do and saves them as strings of identical tiles - this can cause massive savings on blank spaces, which are recorded not as 208,992 zeroes but as "[repeat tile 0 208,992 times]"
Thanks to that, got even quite large rooms to load instantly! Still, I like the cave texture. This isn't bad for an evening's work! Objects - Interactive objects - things you can pick up, look at, use and so on. There are none in this scene just now, because I still have to work out how I'm going to do them! Placing them is easy enough, but loading and saving their attributes (whether they've been picked up already, what state they're in...) is going to be a more difficult challenge. Foreground - The same as the decoration layer, but these will appear in front of the player and objects. I also love how the outdoor tiles in the second half of that screenshot turned out when put together... somehow, I've managed to produce something that doesn't look dreadful. In the interest of keeping this going, here's a screenshot of a test room I've been building - click to expand it! I had a fever dream about this a couple of days ago and had to write everything down before I forgot it all - the monk-mouse's name is now Todo the Tea-Mouse, and the adventure is based around completing his list of things he has to get done today. He comes from a village of mice who are experts on the growing and preparation of exotic tea, but he dreams bigger and has moved out of the village to take advantage of the lower property prices - though his family is doubtful of his chances, he has the aim of one day opening a 100% organic vegetarian cafe. I've noted down a fair amount of subsystem stuff like how I'm going to handle storing room layouts and saving the game state - the platforming is a modified Crystal Towers 2 engine ("modified" in the sense of cutting out the utterly rancid parts) and the interaction and scripting is actually the engine from Hatogate. I've got a couple of objects and events set up now, but I keep on getting inspired to go off and do utterly pointless things like drawing the other character at the top left (who some people may recognize) instead of actually writing the vital stuff to support the continued expansion of the game. I'll be writing a proper editor some time this week, though. It's odd making a to-do list for a game about a to-do list.